Happy October! 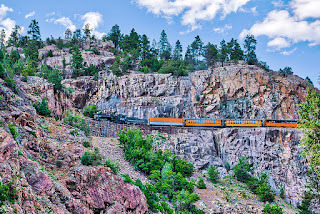 My image today goes back to the first day of July when I was in the Animas River Canyon taking photos of the Durango & Silverton Railway trains on the High Line. This is Locomotive 486 returning from Silverton with it's train for the day and traveling along at the speed limit of 5mph. Note: To process this image I used a new HDR program from Macphun called Aurora. I was impressed by how it brought the rock color out and kept the photo looking natural.